Welcome to Megan Gaudino, author of Never Kiss and Tell, with a post about a trip that inspired a scene in her latest novel! I wanted to talk about something today that I think is pretty amazing. Amazing enough that I wrote it into this book and made it a key part of the story. What I’m talking about is the blue hole. There are actually thousands around the world, but I don’t think many people are familiar with them. They’re these little (or big) pockets of water with steep walls and are almost perfectly circular. 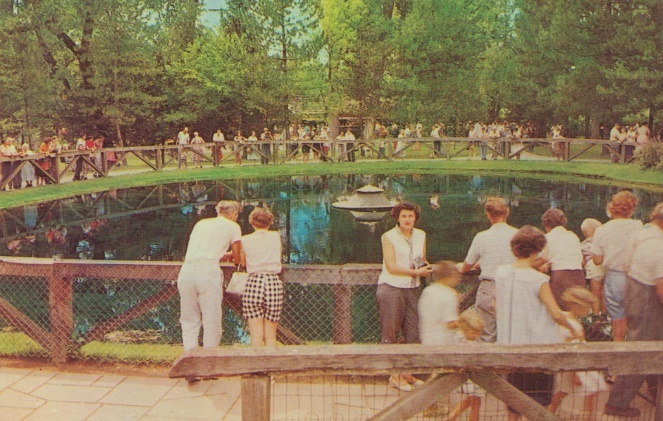 They are essentially sinkholes that form within another body of water and usually date back to past ice ages. That might sound really cool to you or that might sound really boring but either way, if you saw one, you’d be impressed. The blue hole in Never Kiss and Tell is completely based on my trip to the blue hole in Castalia, Erie County, Ohio. I don’t mention Castalia in the book but I do mention Erie County. I first heard about blue holes from my mom and grandmother. 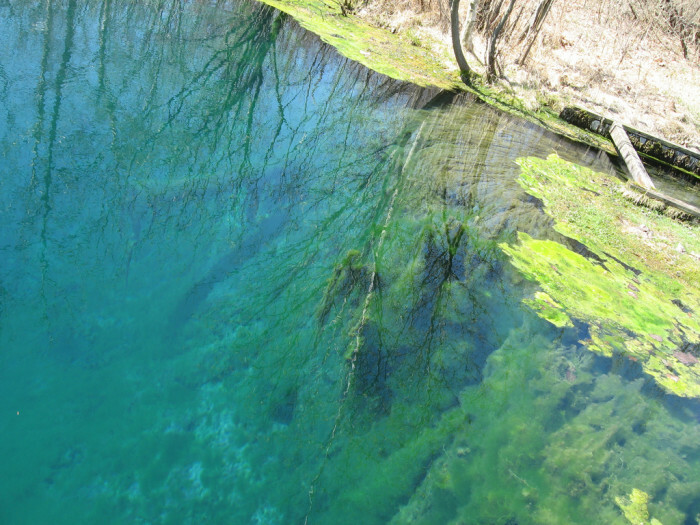 They would talk about their trips out to see this blue hole and the tales of this constantly freezing water and endlessly blue color just seemed like pure magic. I had to go. I had to see it. After some Googling I found out, to my dismay that the blue hole was now on private property and closed to the public but I was in luck, there was another blue hole. I walked up to the small dock and there it was. In all its glory. I think being surrounded by the ordinariness of the buildings and the parking lot made it even more special. It was so blue. Like, ridiculously blue. And clear! You could see all the way to the bottom. The temperature is always at about 49⁰F and because of the water’s makeup it can’t support fish, but it was amazing. My mom said, and like the picture shows, you couldn’t get near the old blue hole but I could’ve jumped right in this one. That is if I wanted too. I know I’m not giving the blue hole justice with my descriptions, and I promise you it is described to perfection in the book, but I do have a point. There are magical things everywhere. I know it can be completely explained by science, and I’m sure the people who see it every day aren’t that impressed, but to me standing there and dipping my toes in the water, I had found magic right here on earth. That makes me pretty happy and so impressed I made it a key point in a book I wrote. 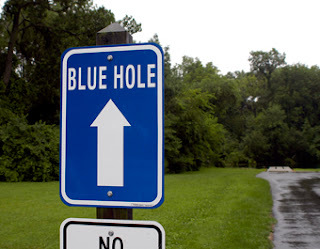 Moral of the story is, find the closest Blue Hole and check it out! Oh, and read about it in Never Kiss and Tell too! Sophia Destino has a target on her back. deal with a life that’s been turned upside down. Then she discovers her importance to guardian legend. She thought she was strong. She thought she could trust Leo. Until she discovers that her biggest fear is Leo’s greatest desire. Leo wants to be human again, and Sophia is the key to him doing just that. 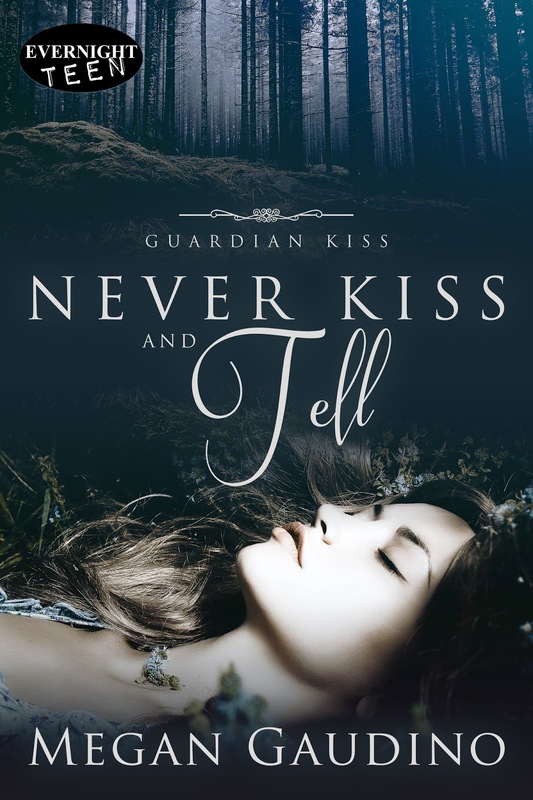 But should she risk everything for Leo and their happily ever after, or has Leo been tricking her all along to get what he wants? “Don’t be afraid.” Leo’s deep voice wrapped around me like velvet. I bolted to the light switch and flicked it up. Was my mind playing tricks on me? “Leo…” It was barely a whisper and held a hint of a question. “My Sophia.” He stood up and held his arms out to me, just waiting. Waiting was something I’d done a lot of for Leo. I kept my spot by the door, with hopes so high they could kill me. He looked the same—out-of-this-world hot, and fortunately not injured in any way my eyes could detect. He wore severely distressed light-washed jeans and a plain black V-neck. His flaxen hair curled wildly around his face and his lips were tight. The look was so good on him I almost couldn’t take it. The dark look on his face told me he was feeling exactly the same way about me and my dress. Without knowing who made the first move, I ended up in his arms. Leo held me close to his chest as my feet no longer touched the ground. I clung to him with everything in me, not caring how hot his flesh felt against mine and forgetting to be angry with him for being gone so long. “I missed you,” he told me as his hand cupped the back of my head while his other supported the entirety of my weight. “I missed you more, I bet,” I told him, believing my words to be true. There were so many thoughts swirling in my head. “Impossible.” He sat us down on the edge of the bed and cradled me in his lap since I refused to end our hug. “Well, you could at least see me.” I had to point out the obvious. I’d had no way of knowing if he was even alive. Before I answered, his lips caught mine in a crushing kiss. My hands buried themselves in his hair and held his face as close to mine as possible. My heart was beating so loudly I was sure he could hear it and I couldn’t breathe but it didn’t seem to matter. Leo’s mouth only left mine to kiss my shoulder, then trailed down to my arm. Where his lips met my skin, visible puffs of steam appeared. “Oh, God.” He groaned and tried to pull away from me. “No,” I told him as I tried to keep him close. “I’m hurting you.” He brushed the hair away from my eyes, just barely touching me. My words were all it took for his lips to be back on mine. Leo fell back on the bed and pulled me with him. First I was on top of him. Then all of a sudden Leo was on top. My hands pressed into his back with all the strength I had as I pulled him closer to me. 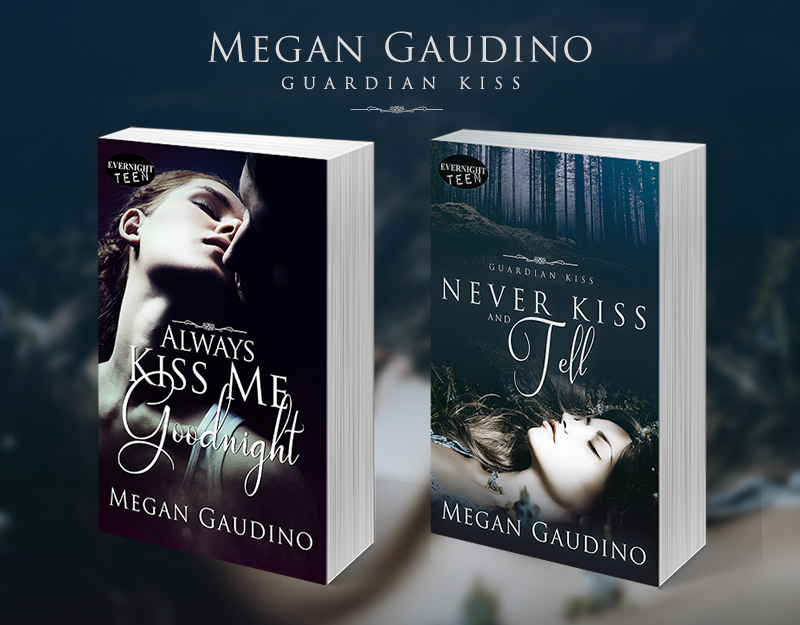 Megan Gaudino works in a high school library by day and on her own books by night. She is particularly fond of every show on HBO and writes YA and NA novels full of emotions. Megan lives in Pittsburgh where you can find her reading, writing, and Instagraming.